Jerusalem (AFP) - An Israeli court Monday extended by 10 days the detention of a Palestinian over the brutal murder of an Israeli woman that has gripped the country, Shin Bet security services said. The body of 19-year-old Ori Ansbacher was found on Thursday south of Jerusalem and her suspected murderer Arafat Irfaiya, 29, was arrested on Saturday. The Israeli intelligence service Shin Bet has labelled it a "nationalist" attack, a phrase used to refer to violence related to the Israeli-Palestinian conflict. 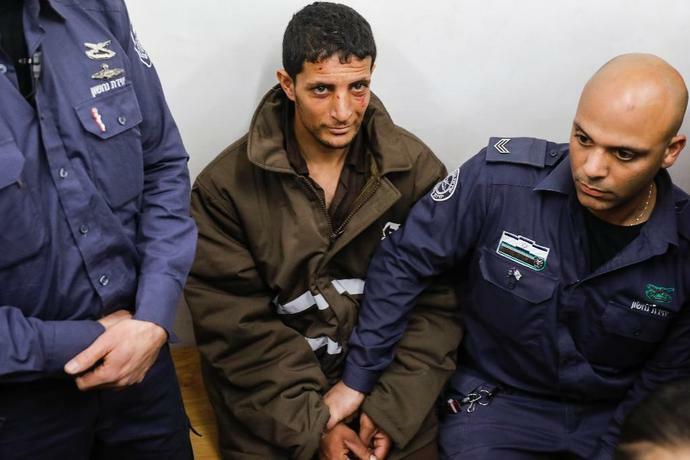 Despite a court gag order, Israeli social media was abuzz over the weekend with what Yediot Aharonot newspaper called "graphic descriptions about the alleged nature of the murder". His hands and feet in shackles, Irfaiya was escorted by Israeli policemen into a Jerusalem court packed with photographers on Monday, an AFP journalist said. The room was cleared before the start of the closed door hearing. A Shin Bet spokesman said the court decided "to extend his detention by 10 days" but gave no further details. Prime Minister Benjamin Netanyahu visited Ansbacher's parents on Sunday at the Israeli settlement of Tekoa in the West Bank, a territory occupied by Israel for more than 50 years. In response to the murder, which shocked and angered Israelis, Netanyahu, who is campaigning for re-election in April, vowed to block some funds to the Palestinian Authority. Netanyahu said he would implement within days legislation passed by the Israeli parliament to withhold some funds in response to PA payments to families of Palestinians jailed by Israel for attacks against Israelis. UNITED NATIONS (AP) - Israel's U.N. ambassador said Wednesday he believes his government will take no action on annexing Jewish settlements in the West Bank until after the Trump administration releases its long-awaited Israeli-Palestinian peace plan. Kushner said the peace plan is to be unveiled after Israel forms a governing coalition in the wake of Israeli Prime Minister Benjamin Netanyahu's election victory and after the Muslim holy month of Ramadan, which ends in early June, the source said. "We will all have to look for reasonable compromises that will make peace achievable," Kushner said, according to the source, who asked to remain anonymous. Kushner, one of the main architects of the peace proposal and who is married to Trump's daughter Ivanka, spoke to about 100 ambassadors from around the world at Blair House, the presidential guest home across the street from the White House. Fox News senior strategic analyst Gen. Jack Keane (Ret.) on Rep. Alexandria Ocasio-Cortez suggesting cuts to U.S. funding to Israel and the debate over efforts to improve U.S. border security.